Who doesn't love the smell of fresh bread baking? Yum! It has to be one of my favorite smells. I have tried several times to make a really good loaf of low carb bread, but wasn't thrilled with the final outcome. After several failed attempts I finally got it right! This recipe makes a very tender bread with a light wheat taste. I used my bread machine to do the mixing and kneading, but you can do it the old fashioned way, by hand. If you use your bread machine, remove the dough after the kneading cycle. Don't let it rise in your machine, it will not rise well a second time. If your oven has a proof setting turn it on to heat the oven. If not, you can proof the dough in your microwave, I'll tell you how in a minute. In a microwave safe bowl, heat water and half & half until warm but not too hot. Stir in the yeast until completely dissolved. Add the oil, sugar and beaten eggs. In a large mixing bowl, combine all of the remaining dry ingredients and stir well. Pour the liquid mixture into the dry ingredients and mix well, adding more Baking Mix if necessary. Turn the dough out onto a lightly floured surface and knead until smooth, but be careful not to add too much flour. The more flour you add the heavier the bread will be. The dough should be a little tacky. Cover the dough and let rest for 15 minutes. Prepare a large l0" bread pan with non-stick spray. Oil the surface of the dough and add it to the pan, cover with a clean towel and place in your oven to rise. If you need to do the microwave proof method, take a coffee mug filled with water and bring it to a boil in the microwave, leave the mug inside and add the bread pan. 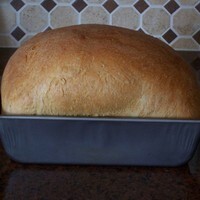 Let the dough rise ONLY until it has doubled in volume, DO NOT let the bread rise too long, it will fall during baking. Preheat the oven to 350 degrees, carefully place the bread pan inside and cook for 35-40 minutes or until golden brown. To test for doneness, tap on the top of the crust, it should have a hollow sound. Take the bread out of the pan, place on a cooling rack and allow to cool until no longer hot before slicing. When completely cool, store in a tightly sealed container or wrap it with plastic wrap. This recipe makes about 20 slices of bread, about 4.75 carbs per slice. I multiplied this recipe by 1.5 and got two large 10" loaves, 40 slices with 3.8 carbs per slice. I hope you enjoy this delicious bread! *Don't punch this dough down, it will not rise well a second time. I have made two other online low carb recipes for bread; this is my third recipe that I have tried. This one is the best so far. I did not have the optional ingredients, I made it by hand, and I kept adding wheat bran instead of flour when kneading the dough, which I did with a spatula (my hands got too much dough on them) in a big mixing bowl until the dough seemed right. After rising once and baking, we tasted it, and it tastes like a very dense whole grain bread. I made a chicken salad sandwich. The baking mix was given online by Pam Solomon, but here it is again: 2 cups almond meal; 1 cup oat flour; 1/2 c all-purpose flour; 1/2 c vital wheat gluten; 1 cup Carbalose (optional, or can substitute more flour or a different flour, like spelt or kamut or amaranth). I have been substituting "ancient" flours like spelt/kamut/amaranth for Carbalose to make a more conventional bread loaf . . . I am not on an Atkins like diet so I can add more carbs. And I double the baking mix above and then divide it between 6 plastic bags. Then I add to each bag all the other dry ingredients that are in addition to the (1.5 cups or so) baking mix. This saves time, I don't have to take out and mess with all the ingredients every time I make bread, I have the dry ingredients for six loaves pre-measured. I still use a heavy spatula to "knead" the bread in a big mixing bowl, and I add wheat bran as I "knead" with my spatula. Kneading with a spatula means pulling the loaf just like you would with your hands, doubling it over, and pressing it down. When the dough has elasticity/body, I turn in onto a (heavily) floured surface, and with floured hands, etc, knead it with my hands the usual way bread is kneaded when making it in your kitchen. It does take extra flour though on your hands to keep them from sticking to the loaf, which means you are adding more carbohydrates. The first time making this bread, I used a generously greased bread pan, but boy did it stick! Never again! So now I form a small round loaf, let it rise in a warm place (like a microwave oven warmed by a large mug containing water that was brought to boiling) for about 20 to 30 minutes (wait longer than that and the loaf begins to spread out --- flatten --- too much! ), and then bake it on a flat silicon baking pad at 350F for 30 minutes. Works every time. I have been eating pretty much this bread only for about 2 years now. The baking mix was given online by Pam Solomon, but here it is again: 2 cups almond meal; 1 cup oat flour; 1/2 c all-purpose flour; 1/2 c vital wheat gluten; 1 cup Carbalose (optional, or can substitute more flour or a different flour, like spelt or kamut or amaranth). I have been substituting "ancient" flours like spelt/kamut/amaranth for Carbalose to make a more conventional bread loaf . . . I am not on an Atkins like diet so I can add more carbs. And I double the baking mix above and then divide it between 6 plastic bags. Then I add to each bag all the other dry ingredients that are in addition to the (1.5 cups or so) baking mix. This saves time, I don't have to take out and mess with all the ingredients every time I make bread, I have the dry ingredients for six loaves pre-measured. I still use a heavy spatula to "knead" the bread in a big mixing bowl, and I add wheat bran as I "knead" with my spatula. Kneading with a spatula means pulling the loaf just like you would with your hands, doubling it over, and pressing it down. When the dough has elasticity/body, I turn in onto a (heavily) floured surface, and with floured hands, etc, knead it with my hands the usual way bread is kneaded when making it in your kitchen. It does take extra flour though on your hands to keep them from sticking to the loaf, which means you are adding more carbohydrates. The first time making this bread, I used a generously greased bread pan, but boy did it stick! Never again! So now I form a small round loaf, let it rise in a warm place (like a microwave oven warmed by a large mug containing water that was brought to boiling) for about 20 to 30 minutes (wait longer than that and the loaf begins to spread out --- flatten --- too much! ), and then bake it on a flat silicon baking pad at 350F for 30 minutes. Works every time. I have been eating pretty much this bread only for about 2 years now. Can you tell me what the Baking Mix contains. Also what is half & half? Coming from Aus we have different brand names. Thanks. half and half is a mix of cream and milk....and the baking mix referred to is listed in the recipe off the side. Half and Half is light cream, approximately 10% butter fat. I stopped using cream. I just use water, and it works fine, the bread tastes good.